At Integrity, we know a person who never learns to be healthy on their own will always be dependent on others. Learning to be independent is the key to getting and staying healthy. People who are totally independent are those who understand how much exercise is important to maintain good health. They also know food is even more important. Once a person is taught the right path to better health it is their knowledge forever. In the past we have not taught people what the right choices are when it comes to achieving optimal health. Instead there has been a myriad of quick fix gimmicks and fad diets promoting ineffective products. There is no "one" quick and easy way to get healthy. It is a combination of doing several things consistently over time that achieves a healthy and disease free body. There are actually 7 components that must be learned by every person who is embarking on a healthier lifestyle. 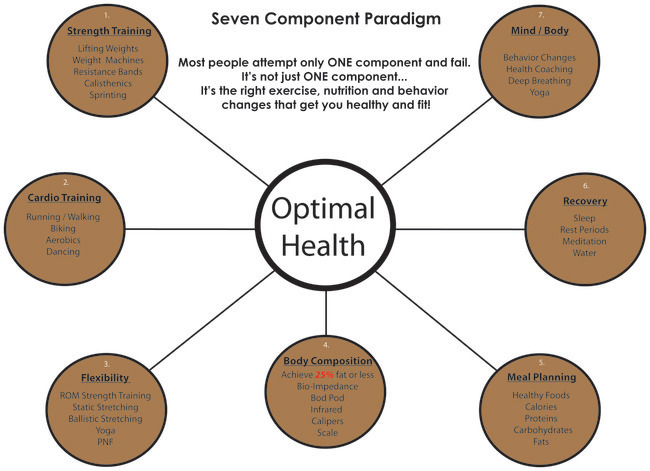 Without understanding and competency in all of these 7 components optimal health is difficult to achieve. Once a person understands these components, getting healthy is inevitable. All one has to do is become familiar with the proper exercises on their plan, choose to eat the suggested amounts of healthier foods 75% of the time, and enjoy life to the fullest. Again, at Integrity, we see it as a win, win!